A new study shows that emissions from trans-Arctic shipping could increase clouds, cooling the atmosphere and surface. Particles from Arctic shipping emissions are known to warm the snow and ice on which they land. They can also increase cloud droplet formation, which results in a cooling effect. As global temperatures increase, melting Arctic sea ice is enabling greater maritime access to the Arctic Ocean. Emissions from shipping are believed to have the potential to warm the Earth further by darkening snow and ice surfaces, or they may cool the climate by promoting cloud formation. Researchers at the U.S. Department of Energy's Pacific Northwest National Laboratory participated in a study that modeled changes in climate trends associated with increases in shipping traffic and related emissions. Results showed that, relative to a shipping-free Arctic, trans-Arctic shipping increased cloud formation and caused the Arctic surface air to be cooler by about 1°C by the end of this century. This study illustrates the complexity of climatic responses to increased shipping in the Arctic, which has been warming at twice the global average. While results showed that increased shipping emissions could reduce Arctic warming, more ship traffic presents environmental risks such as oil spills or increased impacts on marine life. Regulatory and trade agreements could also alter shipping emissions and the ratio of sulfur particles in the atmosphere, changing the impact of ships on clouds and the environment. The findings highlight the need for greater understanding of how Earth systems and industrial activities interact with and influence each other. Scientists have been aware for some time that shipping exhaust may affect the Arctic climate in two competing ways. The released black carbon settles on highly reflective surfaces such as snow and ice, reducing the reflection of sunlight, so the surfaces become warmer. Shipping emissions also affect climate through the sulfur dioxide released as a by-product of fuel combustion. The additional sulfur increases the formation of cloud droplets that can efficiently scatter incoming sunlight back to space, resulting in a cooling effect. In this study, scientists focused on the climatic effects of emissions from ships crossing the Arctic Ocean. The research team estimated shipping trends from the present to 2099 by taking into account the necessary transport of goods from ports in Europe and Asia each month. The team calculated fuel needs and determined emission totals (e.g., black carbon and sulfur) in a global Earth system model used to simulate the net climatic effects of trans-Arctic shipping. Simulations showed that sulfate emissions drove significant increases in cloud cover and the liquid water in clouds, leading to a net cooling of the lower atmosphere and surface. Researchers found that positive feedbacks increased surface reflectivity (induced by sea ice growth) and decreased downwelling longwave radiation (due to reduced water vapor content), which amplified the cooling relative to the shipping-free Arctic. 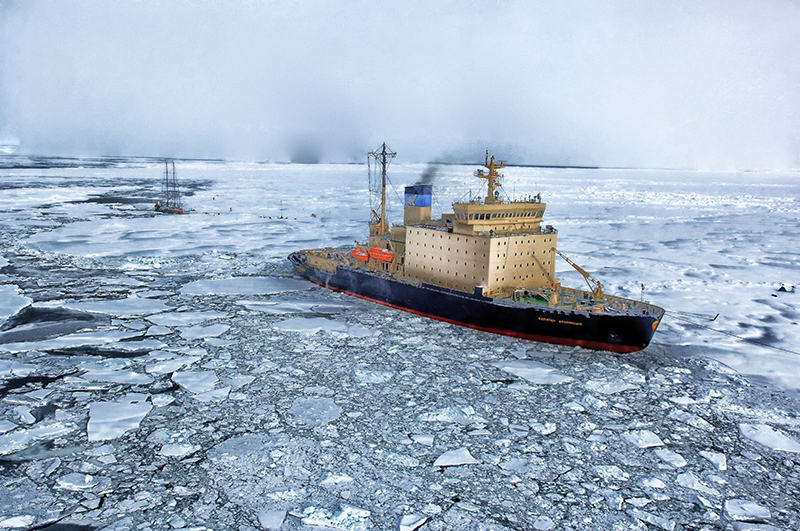 Although increased shipping might reduce Arctic warming, the researchers stress that these results should not be interpreted as a potential method to counter the effects of greenhouse gases, because of the potential environmental risks. Any cooling might also disappear if planned global limits on sulfur emissions from fuel used by the ships go into effect. Without those sulfur-induced cloud changes, the cloud-driven cooling effect would not happen. Sponsors: This work was supported by NASA (ACCESS, AIST, and IDS) and the U.S. Department of Energy (DOE) Office of Science, Biological and Environmental Research as part of the Earth System Modeling program and the Regional and Global Climate Modeling program. Reference: S.R. Stephenson, W. Wang, C.S. Zender, H. Wang, S.J. Davis, and P.J. Rasch, "Climatic Responses to Future Trans-Arctic Shipping." Geophysical Research Letters 45(18), 9898-9908 (2018). [DOI: 10.1029/2018GL078969].